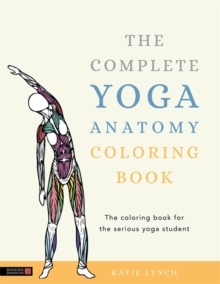 This practical and engaging coloring book helps yoga teachers and students develop their knowledge of the human body. Enhancing your yoga anatomy knowledge beyond basic training can improve your understanding of the biomechanics of the human body as well as how to reduce chances of injury. Katie Lynch covers physiology of the breath, movements of the joints, workings of the spine, shoulders and pelvis and in-depth muscle information, providing anatomical drawings to color in and so allowing learners to visually connect with the new information. The second part of the book introduces Asana Anatomy specifically related to yoga postures, which shows the reader how to break down the knowledge and apply it to specific asanas. Featuring 100+ illustrations and backed by rigorous scientific knowledge, it is the ultimate tool for all those interested in practising yoga effectively and safely.